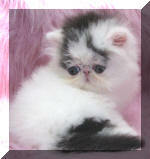 Oceanpurrls CFA Reg since 1989, offering ADORABLE absolutely gorgeous TOP CFA quality Bi color & Solid White Persians with outstanding GC, NW RW CFA pedigrees. All kittens out of CFA show parents. We our known at OCEANPURRLS for the SWEETEST LOOKS & DISPOSITIONS on our Cats, all raised in our home with unconditional love. We take pride in our Persians and it shows, just one look and you can see the difference. Our kittens parents have been chosen for their genetics, to bring you the buyer the most friendly, lovable, sweet natured and open sweet look to them, many get this sweet look form our sire CFA Grand Champion Farallon king of Kensington, known for his ever so sweet look and disposition. Our cats are tested PKD by DNA not untra sound as some persian catteries tested untra sound have been found some Persians Himalayans positive for the pkd gene, we send out proof with each kitten of DNA testing . Our vet gives vaccines to our kittens, this is for the kittens benefit and buyers. Not like some catteries who only get check up at vets and try to save money and do their own vaccines. total health check given on each of our kittens , deworming all by licensed vet. Genetic health guarantee, no ringworm fungus fleas --we raise our kittens in a extremely clean environment. Come see new babies AVAILABLE and be amazed, they are truly stunning. The Information on this page was submitted by the breeder listed above.